If you are looking for a slots game at a casino for ladies with a south of the border feel, look no further than Tres Amigos at Lady’s casino. Tres Amigos gives you, the gambling woman, chances to win by matching up saguaro cacti, margaritas and other symbols. Spin to win more than just a few pesos with Lady’s casino and Tres Amigos. 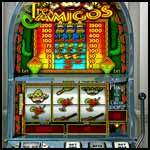 Ters Amigos is 3 Reel, Single Line Slot game that features a Mexican theme. While playing Ters Amigos at the Lady’s Casino you’ll be able to enjoy relish to sounds of traditional Mexican music that adds another facet to this fantastic game. So take a trip south of the border with Ters Amigos.